The bill, which has yet to be approved by the Senate, would introduce two big changes. First, it gives shareholders the right to vote each year on pay packages for executives, including “golden parachutes” for those who leave. Second, it allows regulators to assess whether pay practices at financial institutions with assets of $1 billion or more are likely to encourage risk-taking so excessive that it threatens the stability of the financial system. If so, the regulators can demand changes. The bill also requires members of compensation committees of boards of directors to be independent, formalising what is now standard practice. 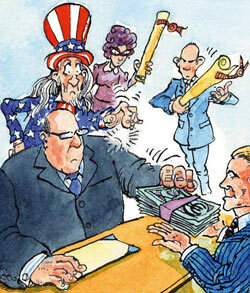 Consultants hired by boards to advise on executive pay must also be independent. Rather belatedly, the bill orders America’s comptroller-general to study whether there is a connection between compensation structures and excessive risk-taking. Barack Obama championed a “say on pay” for shareholders long before he became president. It would bring America into line with Britain, which made it a legal requirement in 2002. Yet unless institutional shareholders make the most of their rights, getting a vote may not make much difference. There is a danger that they will simply outsource the hard thinking about pay to advisory firms such as RiskMetrics, says Jeffrey Gordon of Columbia Law School. This may encourage the sort of herd mentality that produced the widespread and disastrous enthusiasm for paying bosses with share options, he says. Worse, some advisory firms work as consultants for boards as well as coaches for shareholders, so may have conflicts of interest similar to those that have undermined the effectiveness of auditors and credit-rating agencies. The British experience is telling, argues Mr Gordon in a recent article. There are hardly any votes against compensation packages at British companies. (The same has also been true at the handful of American firms that have introduced a vote on pay in recent years.) That may be because shareholders and managers reach agreement before votes are held. But America’s more diffuse shareholding structure makes such understandings harder to achieve, he says. Moreover, as in Britain, the shareholder vote will only be advisory, and can be ignored by management. In May 59% of voting shareholders of Royal Dutch Shell, an oil giant, rejected the executive pay package for 2008, but the company intends to pay it anyway—though it lamely promised to consult shareholders more closely in future. As for big financial firms, the bill would allow regulators to review how incentives are structured under their pay practices. But they would not be privy to the amounts paid or the identities of the recipients. That might insulate them from the political pressures heaped on Kenneth Feinberg, the “special master” appointed by Mr Obama to prevent inappropriate pay at firms that have received help from the taxpayer. Angry citizens want Mr Feinberg, who is expected to rule soon on bonuses at various financial firms, to veto pay-outs such as the $100m bonus for Andrew Hall, an oil trader at Citigroup, even though he seems to have earned it the old-fashioned way, by doing his job very well. The bill faces an uncertain future in the Senate, where it may get lost amid more sweeping financial reforms. Then again, senators enjoy railing against corporate fat cats as much as the next politician. Copyright © The Economist Newspaper Limited 2009.